Well, I think it’s safe to say that Melbourne has been one of the best school field trips I have ever been on. We left Sydney early Sunday morning and were at the airport by 6:30 a.m. Surprisingly, there wasn’t a lot of security at the airport aside from some random searches at the security check-point. Maybe it was because we were with a group, but they didn’t even check our IDs and only looked at our boarding pass right before we got on the plane. There might have been less security because it was a domestic flight too, but it definitely took less time compared to U.S. security checks. It’s sometimes hard to remember that our airports were like this before September 11. Once we arrived in Melbourne, we headed straight for Queen Victoria Market. It had everything from souvenirs and clothes to meat and produce markets, with lots of little cafes and coffee shops nearby and street performers. On Monday, I started the day off touring Melbourne’s sports scene, specifically the site of the Australian Open. I’m a huge tennis fan, so getting to tour the grounds was a great experience. My brother went to the Australian Open when Rafael Nadal won in 2009. Not only did he bring back pictures, but he also brought me an autographed tennis ball from Nadal. Not only that, but I’ve also seen the locker rooms where Nadal and many other players have gotten ready for the big matches, the media room where they give interviews and walked the Walk of Champions. In the afternoon, we had a guided tour of the graffiti around the city. 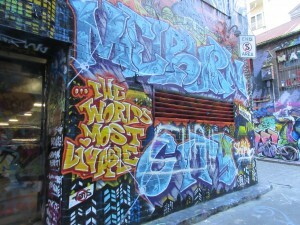 We made our way through different alleys viewing the culture of graffiti and learning about its history in Melbourne. Graffiti is illegal in most places, but that doesn’t seem to stop people. Since street art contributes to the vibrancy of an urban environment, Melbourne has issued permits for artists to engage in legal street art in some public spaces, with the building owners’ permission. The city is even working with artists to set up educational alleys where young people (who would otherwise graffiti in the city) can work with artists to practice their skills and still produce street art and murals. On Tuesday, a few of us made our way to St. Kilda, a beach town outside of the city. If you’re ever in Australia, I would highly recommend spending a day in St. Kilda, going to the beach, touring the town, its theaters and Luna Park. For those of you that don’t know, Luna Park is an amusement park right on the boardwalk that was incidentally designed by the people who designed Coney Island in New York. On our last day, I went on my last tour to the old Melbourne Gaol (Jail). This is where Ned Kelly, a famous Australian bushranger and longtime criminal was put on trial and sentenced to death by hanging for shooting at police. I participated in a reenactment of the courthouse trial, and later we watched Ned and his mother meeting at the gallows right before his death. We also got to see an exhibit of Ned’s iconic suit of armor and much more at the Victoria State Library. Overall, Melbourne was an awesome city to visit! Unlike Sydney, it was established by entrepreneurs and not as a convict settlement. It has a rich European culture with many Greek and Italian restaurants. It also has the oldest surviving Chinatown in the world. In some respects, Melbourne reminds me of Boston, especially when strolling down the Yarra River overlooking the city. Melbourne is a rich cultural city, filled with music, theater, art, sports, and history. After a short visit, it’s clear to me why it was just named the world’s most livable city, and I had a great time exploring it, even just for a few days.